Goodreads Synopsis: Britt-Marie can’t stand mess. A disorganized cutlery drawer ranks high on her list of unforgivable sins. She is not one to judge others—no matter how ill-mannered, unkempt, or morally suspect they might be. It’s just that sometimes people interpret her helpful suggestions as criticisms, which is certainly not her intention. But hidden inside the socially awkward, fussy busybody is a woman who has more imagination, bigger dreams, and a warmer heart that anyone around her realizes. 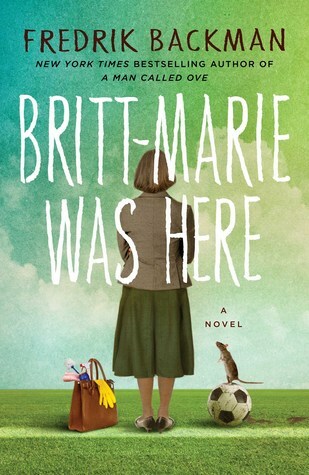 Review: You might remember Britt-Marie from My Grandmother Told Me To Tell You She’s Sorry. Britt-Marie has officially left her husband but has no idea what to do now. She’s never really been on her own before, so she gets a job working in Borg, a town that has been hit hard by the financial crisis. She meets people she never imagined she would find, she meets children who take a liking to her even though she can’t understand why and she learns that there is more to Britt-Marie than she thinks. Which is only something she learns from the people she finds so eccentric. I have to admit, this is probably my least favorite book I’ve read of Backman’s so far and at one point I thought I would never like it, but it grew on me (and of course, I shed some tears — does the man know a way not to a readers heart?). I’m still somewhat undecided on the story as a whole, I wasn’t as emotionally connected to this story like all the others by him which was a little of a let down. I like Britt-Marie but I don’t love her but I do truly love one of the many story lines in this book — that age doesn’t mean a thing, you can still experience a dream no matter the age as long as you have the courage to go for it.